Randi Nygård of Ensayo #4 held a conversation with Timotheus Vermeulen about the anthology Dei viltlevande marine ressursane ligg til fellesskapet/The Wild Living Marine Resources Belong to Society as a Whole at Coast Contemporary: Rugged, Weathered Above The Sea, a maritime art journey along the Norwegian coast, from Svolvær to Bergen, October 21.- 26. 2018. For its second edition, Coast Contemporary explored the social, economic, and political values of the Norwegian landscape. Curated by Charles Aubin and Tanja Sæter, this six-day program gathers artists, architects, curators, writers, and environmental scholars to explore Norway’s centuries-long construction of a national affinity for nature, and how a changing climate will transform cultural imaginations. The publication The Wild Living Marine Resources Belong to Society as a Whole got its from after Section 2 of The Norwegian Marine Resources Act and is part of Ensayo#4. 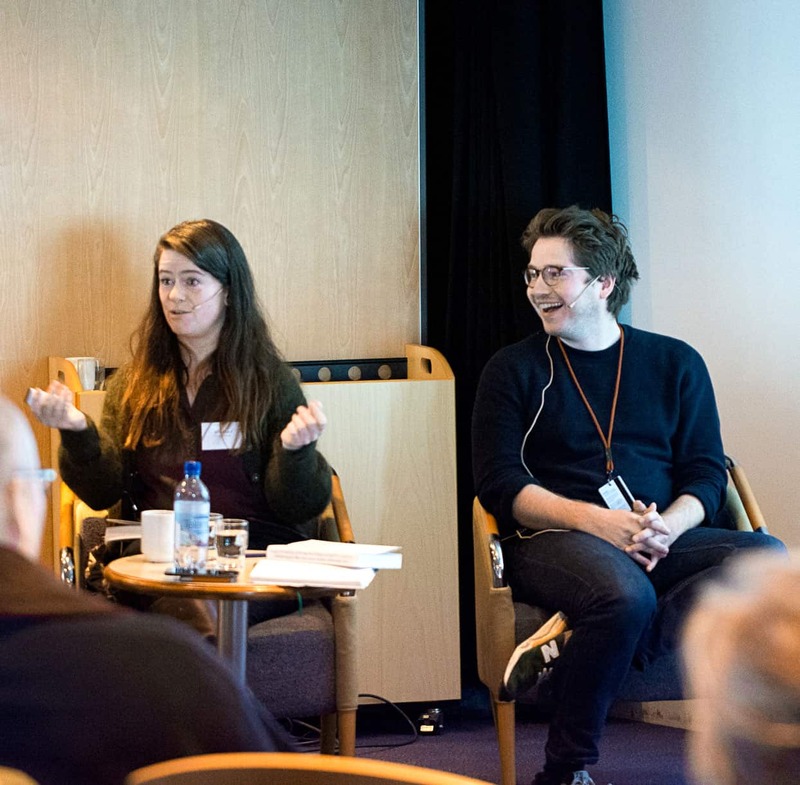 Nygård and Vermeulen spoke about what happens when artists are the initiators of interdisciplinary projects, and why the law should meet poetry and art (and oceanography, philosophy, sociology, and biology.) Nygård mentioned Derrida who, in his book The Animal That Therefore I Am, writes that, if a thinking about animals exists it, must derive from poetry. So if we are to integrate the more-than-human into our democratic and political systems and give them more legal rights, the question of how to represent nature concerns both art, philosophy, science, and law, and might not only derive from logical thinking. Nygård also said that artists may be good at asking naive but basic questions concerning the very foundations of the paradigms which the sciences and our worldviews are built on, creating a common ground where foundational discussions may form. In her belief, artists use feelings and intuitions in ways which might be foreign to most other sciences. Vermeulen discussed the importance of moods, which Nygård related the necessary shift in perspectives–from nature as resources in a distant and dull world to an enlivened environment where we are integrated and where everything may have a level of inner consciousness and therefore also moods. The conversation took place in a particularly unruly part of the trip, making the concept of The Oceanic Feeling fit very well. *From Randi Nygård`s text The Oceanic Feeling in the anthology.